The now customary rapid progress on the Patriot continues, and the project now boasts a new website. The project has suffered one slight setback however, as it encountered machining problems with its inside cylinder block (cast using polystyrene patterns, in a significant development for steam engineering). The decision was taken to cast a new block, at a reported cost of only a further £800 for the pattern, casting and machining. The cost savings generated by poly patterns are such that, according to this post by a group member on National Preservation, even twelve consecutive errors would make their use cost neutral. The outside cylinders will follow in 2014, also using poly patterns. Elsewhere on the locomotive, the outside motion brackets and boiler support brackets have been cast and machined, the frame stretchers are now fitted and both the wheels and cab should be now have arrived at Llangollen for fitting to the chassis. Although previously scheduled for announcement in 2014, the name of P2 2007 has been confirmed as Prince of Wales, the news having seemingly been brought forward to mark Prince Charles’s 65th birthday. The prince has some association with the A1 Trust, having formally named Tornado, been a passenger on the royal train hauled by the A1, and even having travelled on its footplate. While this choice of name breaks with the tradition of Scottish-themed names carried by the previous P2s, the association with the prince seems likely to pay off in terms of profile and good will for the project (and numerous locomotives, including an LNER A3, have carried the name previously). In other P2 news, the P2 Steam Locomotive Company announced on September 3rd that its Founders Club had already acquired 35 members; by November 12th it was able to tweet that this number had reached 130. 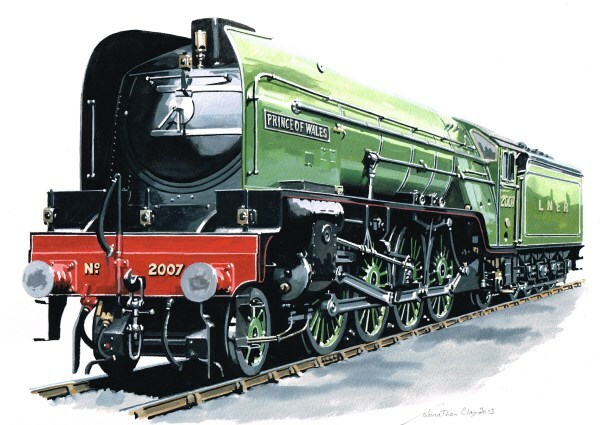 In August a new group was formally established to construct a new 3MT standard tender engine, whose completion will (along with other new builds) mean that every British Railways standard class is represented on Britain’s heritage railways. The group appears to have made a sure-footed start, with three components already on order (smokebox door, smokebox dart and, already completed, the hinge pin for the door), quotes sought for two more (the inner smokebox door and protection plate), and various on-locomotive plates already in existence. The group’s website indicates that it is taking seriously the business of researching the task and learning from existing new build projects. The October update on 82045 includes pictures of the driving wheels, and details of how work on them and the axelboxes will be split between the Boro Foundry, Buckfastleigh and the main project group in Bridgnorth. Collaborative work continues with other groups: the casting for a cylinder for 76079 on the North Yorkshire Moors Railway using the group’s pattern has been completed, and successfully to judge from early indications. A fee has also been agreed for the loan of the existing pattern for BR standard 3-foot pony wheels. It has been confirmed to New Build Steam that the Boro Foundry are to be appointed as the main contractors for the manufacture of the 567’s main plates; they will order the plates from Tata and complete all machining. This decision follows substantial work on the design of the plates and the fitting of the cylinder block. The block will be mounted using doubler plates, which will have the further beneficial effect of strengthening the front of frames – a known area of weakness for the class in operation. Work has also been undertaken to update the bogie design to more modern standards, and collaborative exercises undertake with other new build groups, namely the Brighton Atlantic and Saint projects – the latter revealing that the shape and diameter of the Saint’s tapered buffers are identical to those on the 567. A coincidence, a draughtsman moving from Gorton to Swindon or, the group suggests – with tongue in cheek, one trusts – a little plagiarism on the part of the GWR? The George the Fifth Steam Locomotive Trust has now had its charitable status confirmed (Registered Charity Number 1153991), has unlocked the first tranche of its matched funding and is close to making the second. On the design and engineering front, the group’s recent focus has been the frames, whose thickness they plan to increase partly for extra strength and partly to accommodate the processes of Tata. Evaluation work on the class’s valve gear has also been undertaken: inaccuracies on the drawing board have long been known to have caused irregularities in the engines’ beats, thanks to errors by the German company responsible for designing the valve gear, the Schmidt Superheater Company. By the time the problem was recognised, war had made it impossible for the LNWR to require the company to undertake remedial work; and in practice, the problems did not produce major operational difficulties. Finally, the group has been given a whistle, purportedly taken from the last L&Y 4-6-0 prior to its scrapping in 1951; the intention is to auction this item to raise funds, subject to documentary evidence to show the veracity of its status being secured. 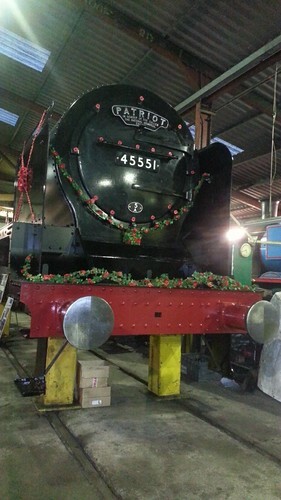 Meanwhile, pictures of work on the smokebox door can be seen on this blog update. Copies of the group’s GER F5 drawings have been passed to Tyseley, and the group is now awaiting a formal offer for workshop machining and frame erection. The group was also expecting, at the time of its last engineering update, to place the order for the diagonal stay that sits beneath the bunker and footplate, and it has passed a drawing of the footplate supports to Premier Castings. Consideration is being given to turning out the locomotive in GER Prussian Blue livery, while the group has also clarified that the number 67218 has been chosen primarily due to the availability of the smoke box plate – that, and the fact that the next number in sequence, 67219 (obviously enough), was the number of an F6! The second combined stretcher frame has no been cast, and the third is due for completion in December. The latest news update from the Brighton Atlantic contains plenty of detail about the arrival, testing and fitting of new components. The cylinder block from Barry rescuee 2861 has now been reclaimed for us in 4709, albeit with much work still to do to replace bores and cover studs, and fit various finishing items. The bosses for the trailing driving wheels have now been machined and fitted, and their keyways cut. The Dean Goods Facebook group continues to post occasional updates, including multiple reports of progress towards opening a bank account. Despite reports on October 3rd, October 14th and November 4th, the group appears not to have been able to complete this step yet. They have also stated that a formal constitution for the group is in the works. 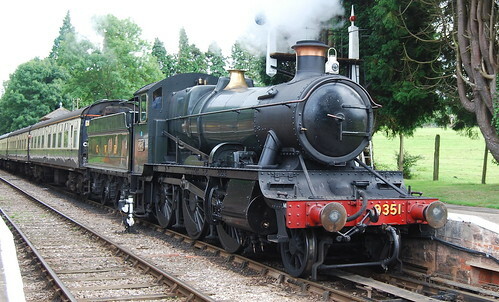 Meanwhile, the West Somerset Railway has withdrawn its ‘small mogul’ 9351 for its first ten-year overhaul. 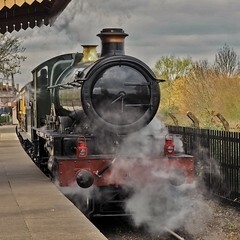 A rebuild of praire tank 5193, the locomotive represents a class that only ever existed on the drawing board at Swindon, and has proved a highly useful performer on the railway since it entered service in September 2004. Wouldn’t ‘Duke of Rothesay’ be a better name for 2007?